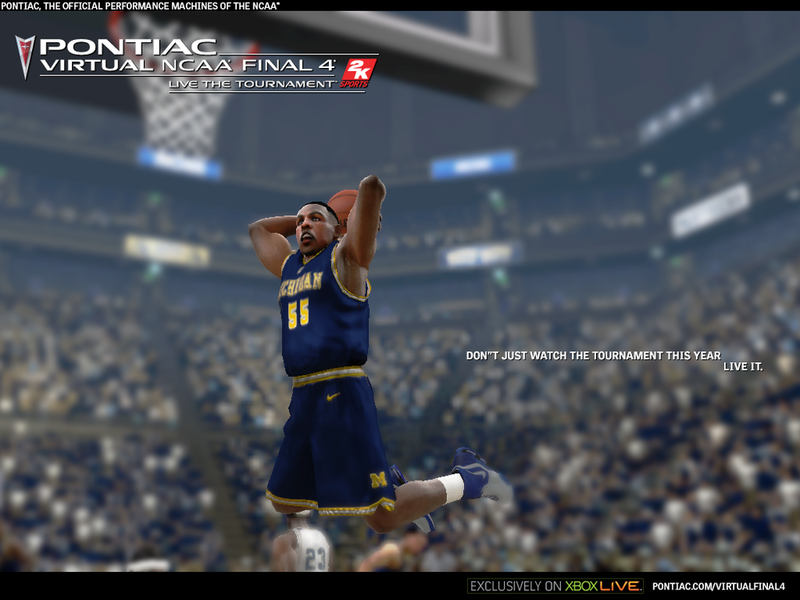 As Creative Director at Play we created the first ever virtual/actual event of its kind, The Pontiac Virtual NCAA Final 4 (PVNF4). Including qualifying rounds, the PVNF4 had over 235,000 games played on PlayStation and Xbox consoles, with 6,300 qualifiers, and was 70% accurate in determining real-world game outcomes. If you love March Madness, the first few days are non-stop hoops bliss. As the tournament wears on, the gaps between games gets longer and longer and the melodramatic human-interest pieces on TV get sappier and sappier. Pontiac approached us to come up with a way to leverage their NCAA sponsorship, help them become more relevant to a younger demographic, and come up with a new "institution" for the NCAA Tournament. This program touched so many different types of media, I would not have been surprised if I found out that I needed to create a spot for the overseas laser disc market. Instead of listing them, the video to the left attempts to cover them all. WARNING: The client had a weird fascination with P.O.D., so please excuse the ridiculously repetitive audio loop. I had the pleasure of working with 2K Sports to create the User Experience and flow of the PVNF4. The toughest part of the whole process—explaining how online consoles worked to the folks at GM. The PVNF4 followed every game of the tournament. Every participant got one “slot” in each of the four regions of the tournament. The slot was determined by pre-tournament qualifications and team preferences. If you won a game, then you had an active slot in the next round of the tournament. A new team was assigned to each round to mirror the events of the real-world tourney. The PVNF4 culminated with the top four gamers being flown in to play out the Final 4 match-ups in front of a roaring crowd the night before the actual event was to take place. The coordination between the NCAA, 2K Sports, CBS, GM, Jack Morton Associates, Leo Burnett Detroit, Digitas and the good people at Hoop City took diplomatic skills not seen since the signing of the Treaty of Versailles... thats a tad melodramatic but you get my drift. Every single word about the PVNF4 that was in TV, print, online, or out of Greg Gumbel's pie hole—all me.